DETROIT -- It took a bankruptcy for Chrysler LLC to return to network TV. The automaker, which has been operating since last Friday under Chap. 11 bankruptcy protection, is breaking a national prime-time TV campaign May 11 to try to build consumer confidence in its Dodge, Jeep and Chrysler vehicle brands. The media buy is a major shift for Chrysler, which in a cost-cutting move converted all its TV spending to local spot advertising earlier this year. According to Chrysler, the spots will run on top shows such as NBC's "30 Rock," "Biggest Loser" and "Southland;" ABC's "Dancing with the Stars" and "Desperate Housewives"; and Fox's "24," "Fringe" and "House." It will also span print and, next month, digital media. For Americans now accustomed to the daily dose of grim news about Chrysler, the message might be a bit hard to swallow. The first of two 30-second commercials from BBDO, Detroit, part of Omnicom Group, is dubbed "Bright Future," and it refers to Chrysler's reorganization and alliance with Fiat that will build a "meaner and leaner" company for the future. That spot will air for about a week on ABC, NBC and Fox and be succeeded by the second commercial that focuses on the three brands' products and their features, without reference to reorganizing because "we don't want to keep harping that we're restructuring," a Chrysler spokeswoman told Advertising Age. Recent consumer research by Chrysler showed consumers wanted to know "about our products, tell them why they should buy our vehicles and give them a reason why they should be confident in the future of this company," Steven Landry, executive vice president of sales and marketing, said in a statement. The campaign delivers on those points, he said, and "gives us the opportunity to reinforce that it's business as usual and demonstrate a bright future ahead for Chrysler," he said. The question, though, is whether the move will generate criticism from taxpayers complaining their money loaned to Chrysler is paying for TV commercials and air time. 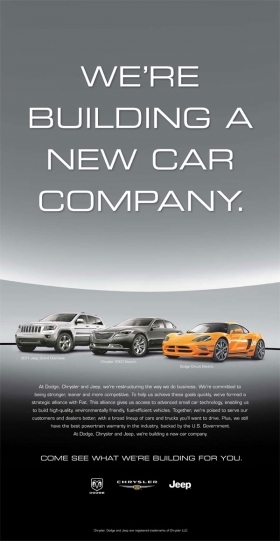 A newspaper ad late last year from Chrysler thanking the U.S. taxpayers from giving the auto industry TARP funds was roundly bashed as a waste of money. But most auto experts agree Chrysler needs some kind of ad messaging out there to deal with ongoing negative news. The national TV buy is through May, the Chrysler spokeswoman said. The automaker's remaining 3,200 dealers may also run a 25-second version of the three-brand commercials or other individual product spots and add their own five-second retail message, she said. But many dealers and regional dealer ad associations are already struggling financially, so it's not clear how many would have the money to buy media for the new work. Peter Grady, director-dealer operations at Chrysler, testified in bankruptcy court May 4 that some 400 Dodge, Jeep, Chrysler dealers had closed their doors since January 2008, and the numbers have accelerated in recent months from an average of about 15 monthly to 35 and 40 monthly. A dealer along the Eastern seaboard said his regional ad group plans to run the new ads on local TV, but only has enough money to buy media though May. None of the dealers in the group are willing to kick more into the fund, because they fear they won't be reimbursed by Chrysler, he added. The blitz is themed "We Build" and the ads will also run in Mexico and Canada, where they will be tweaked to meet local market needs. Canada will run the two corporate TV spots through May, with the product spots slated to air through June.